Senior Rashtriya Swayamsevak Sangh (RSS) leader Krishna Gopal today claimed the practise of untouchability didn't exist in ancient India and it came from outside over the last thousand years. 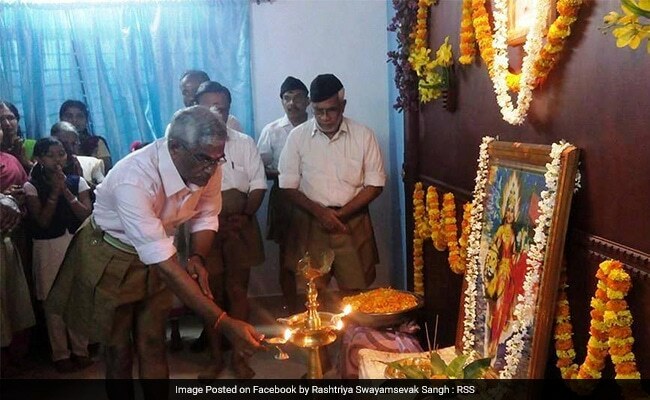 Hyderabad: Senior Rashtriya Swayamsevak Sangh (RSS) leader Krishna Gopal today claimed the practice of untouchability didn't exist in ancient India and it came from outside over the last thousand years. "Jab maine maana insan mein Brahma, Vishnu aur Shiv hain (When I believe (as a Hindu) that there is Brahma, Vishnu and Shiv in humans), then why discriminate? This (tradition of) discrimination came in the last thousand years. There was no such thing as the untouchability in this country (before that)," he said. "Our Vedic rishis never mentioned this. Where did it come from? It came from outside," Mr Gopal claimed. Addressing Sangh volunteers here on the Vijayadashmi Utsav organised by the Sangh, the joint general secretary of RSS said no person living in "our streets, our towns can be untouchable". "A Hindu thinks of the well-being of everyone. We never say if you do not listen to us you will go to the hell. We follow 'Sarve Bhavantu Sukhinah' (let everybody be happy)," he said. "No person is small...All are equal." Mr Gopal called on the RSS volunteers to reach out to all sections of the society and eradicate all forms of discrimination. Sardar Vallabhbhai Patel, when he was the chairman of Minorities Commission, had opposed religion-based reservations, he claimed. The RSS leader also said that due to the relentless work of Sangh volunteers "today we see Independence Day and Republic Day being celebrated openly in the Northeastern states that have been suffering violence of separatists forces for long". RSS members have sacrificed their lives in the face of anti-national forces, he said. In Kerala, over 400 RSS volunteers have been killed, he said, adding that in the last one year alone, over 35 volunteers were killed in Kerala, Tamil Nadu and Karnataka. Afghanistan's Vice President Is Known For Brutality. But This Time He May Have Gone Too Far.